Some U.S. politicians are complaining that China has kept its currency artificially low. 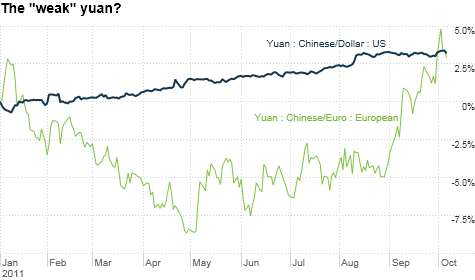 But the yuan is actually up against the dollar and euro in 2011. Click chart for more on currencies. NEW YORK (CNNMoney) -- A newsflash to the legislators in Washington who suddenly want to act tough against China for currency manipulation: Have you looked in the mirror lately? Simply put, buying up U.S. Treasuries as if they were Missoni apparel at Target leads to lower interest rates and a weaker currency. The do-nothing Congress hasn't made matters any better. The debt ceiling debacle this summer didn't help the dollar either. The short-term economic outlook is dismal. Focusing solely on longer-term deficit reduction at the expense of the current health of the cash-strapped/underwater on their house/nervous about their job American consumer also makes the U.S. dollar less attractive. You may not agree with President Obama's latest jobs plan. But this economy needs some form of targeted and immediate stimulus to get it back on solid footing. Austerity isn't the answer. Just ask Greece. Now don't get me wrong. I'm not endorsing China's policies per se. As much as China has opened itself up to the West and capitalist ideas, the government does not let the yuan trade as freely as it should. That's a huge problem. However, the U.S. does need to concede that China has taken baby steps to let the yuan appreciate. After all, it is up against both the dollar and the euro this year. Should the yuan be even higher? Probably. But provoking China into a possible trade war is not the answer. Are U.S. manufacturers hurt by the fact that an artificially low yuan makes Chinese exports cheaper? Of course. Funk metal band Primus (at least I think they're funk metal?) wryly comments on this in a song called "Eternal Consumption Engine" on their new album. Lyric: "Every time I get a little bit bored. Head to the Wally-Mart store. Livin' high on the greasy hog. As long as they don't deport my job. Cause everything's made in China." Still, we need to ask ourselves this. While trying to protect manufacturing jobs in the U.S., do we risk damaging the broader economy even more by antagonizing China? Like it or not, China holds nearly $1.2 trillion in U.S. Treasury debt. The Chinese are already not thrilled that the same dollar-damaging policies I've written about have also withered away the yields on long-term bonds. "A currency war would be very bad for the entire economy. China has an increasingly important pull," said Ashraf Laidi, chief executive officer of Intermarket Strategy Ltd, a London-based research firm. "Its bargaining power has increased. If the U.S. points fingers, it will be even worse for the dollar." Also, isn't the U.S. more of a services-led economy these days anyway? Aren't "we" trying to export more to "them?" Fast food chain Yum Brands (YUM, Fortune 500), for example, now generates more revenue from China than in the U.S. Luxury good retailer Coach (COH) is rapidly expanding its presence in China as well. Starbucks (SBUX, Fortune 500) also has aggressive plans to open more stores in China. Do we really want to open up the door for China to retaliate and slap tariffs or more onerous restrictions on American companies? "To change the trade dynamics between the U.S. and China is a tricky, delicate manner. You can't use a sledgehammer," said Andrew Busch, global currency and public policy strategist with BMO Capital Markets in Chicago. "The repercussions will be swift and negative. 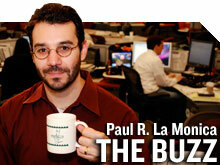 There are other ways to address the issue that could be more productive," he added. It would be one thing if China could truly be singled out as the only major nation on the planet that manages its currency. But as I've pointed out, the U.S. does it too. And one man's currency "manipulation" is another's currency "intervention." Many countries play funny games to move the value of their paper up or down. The central banks of both Japan and Switzerland have taken steps this year to rein in the surging yen and franc. Both currencies have been bid up in speculative "safe haven" trades this year due to the deteriorating outlook for the dollar and euro. Each country, but especially Japan, felt it necessary to act to protect their own economic interests. A runaway yen could be disastrous for Japan since it would make goods sold by companies ranging from Toyota (TM) and Honda (HMC) to Sony (SNE) and Panasonic more expensive overseas. Sure, there is a difference between stepping in to stop the free markets from running amok and letting the free markets do their job in the first place. But make no mistake. Everybody "manipulates" their currency in some fashion. The U.S. needs to recognize that and move on. Working with China, as opposed to more heated rhetoric, can help solve some of the world's economic problems. "If you are always complaining about your lawn, you should cement it over and not have grass. It's always easier to blame somebody else for your own problems," Merk added.